Kinvolved, the company Alexandra cofounded to boost school attendance, was still a very demanding infant. She had no time for a boyfriend. But a friend really wanted her to meet this guy at a happy hour event, and Alexandra figured there was no harm in some free drinks and socializing. So on an early evening in January 2015, Alexandra took the PATH train from Manhattan to the New Jersey gathering and a painfully halting attempt at conversation with Mr. Casual Setup. He answered all the getting-to-know-you questions she asked about his work and hobbies but did not ask her a single question in return. “I had to say things like, ‘In case you’re wondering, I work in education,’ ” remembered Alexandra, who grew up in Glenside and who had recently learned she and her cofounder would be on Forbes’ 2015 30 under 30 list. She was silently planning to take the next train back home when a third person walked up: Nick. Setup Guy left. Alexandra and Nick talked until the event ended, then exchanged contact information. A week later, they met for Italian food. They laughed the whole night, and by the end, Nick had made even waitress Georgia feel like their friend. “The time just flew, and I wanted it to go on forever,” Alexandra said. Their differences contributed to their falling in love as much as their similarities did, the couple say. “He has helped me to slow down, be more calm, and have more patience and compassion for those around me,” Alexandra said. Nick said sometimes, he can be too laid-back, which is why he’s glad Alexandra is there to encourage him to go after what he wants. “She gets me out of my shell,” he said. In 2016, the couple adopted their Cavalier King Charles spaniel, Jolly. Less than a year later, they got a place together in Jersey City. On New Year’s Eve 2017, Alexandra, who is now 32, and Nick, now 38, served dinner and champagne to their friends. Outside, the night was freezing cold. “Should we just stay in?” Alexandra suggested. “No, I really want to go out tonight,” said Nick, much more insistent than he usually was about such things. Out they went to a Jersey City bar. “I’m so cold,” Alexandra said on the way. It killed Nick not to give her his jacket, but he feared she would find something he had tucked into the pocket. As the countdown reached 2018, Nick kissed her, hugged her, and knelt on the dance floor. “Will you marry me?” he asked Alexandra, holding out the ring she had always wanted — the one that had belonged to her beloved, late grandmother Mary. “YES!” Alexandra yelled, hugging Nick, then Claire, and then Claire’s now-fiance Jake, who filmed the whole thing. The day of their wedding, Nick presented Alexandra with a diamond necklace that was really a gift from three people: him; his dad, Frank; and his mom, Janice, who died shortly after a cancer diagnosis in 2016. Janice told Nick she loved Alexandra the day she met her, and the feeling was mutual. During Janice’s illness, Frank was deeply moved by the love and support Alexandra gave his son, his wife, and himself. He loved Nick’s idea to make a necklace from the diamond in Janice’s engagement ring. And Nick loved seeing it sparkle on their wedding day. “It allowed my mother to be with us,” he said. The couple married at the National Shrine of St. Rita of Cascia in a traditional Catholic ceremony led by the Rev. Msgr. Charles H. Hagan, who had married Alexandra’s parents and who was a cousin of her also-beloved late Grandma Myra. The reception for 200 was held at the Ritz-Carlton, one of the locations the bride’s parents scouted out a few days after Nick proposed. Bill had been researching venues for some time before the official engagement. “OK,” Alexandra told her dad when she found out. “Just don’t tell Nick. It will be our secret.” She also had one request: A glamorous chandelier. Note the Ritz has a very big one. 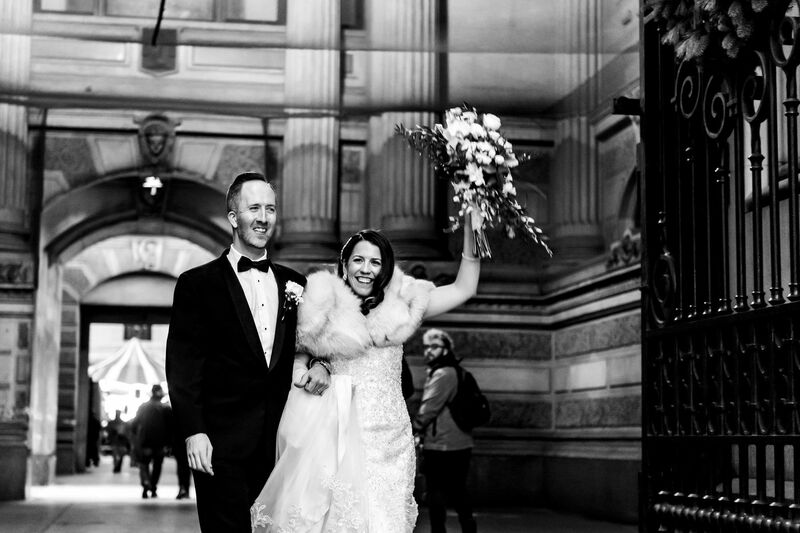 Walking into the reception with her new husband to the applause and cheers of their guests made Alexandra swoon. They danced to Billy Joel’s “You’re My Home,” and she felt amazed at all that was happening. The dance was more nerve-racking than their kitchen practice sessions, but it also had its own rewards. “It was so special knowing that all of those people were there for us,” she said. Alexandra Meis dances at her wedding. A bargain: Having started a business herself, Alexandra wanted to lend her support to new business owners. Hair stylist Laura Nicholas Artistry and Benjamin Deibert Photography were more affordable than more established vendors and provided fantastic service, she said. Nick offers this tip to other couples: Don’t just look at photographers’ work, pay attention to what interacting with them feels like. “The photographers are literally a part of the whole day. You need to find someone you have a good connection with,” he advises. It was great working with Benjamin and his wife and business partner, Ashley, he said. A splurge: The Ritz’s food, service, and ambience — including that chandelier — made it worth the money, the couple says. Ten days on St. Kitts and Nevis in the West Indies, where they hiked on a volcano, took an adventurous ATV ride, and lounged at the pool, where Nick had to compete for Alexandra’s attention with a retriever/lab mix named Cosmo. Officiant: The Rev. Msgr. Charles H. Hagan, pastor of Our Lady of Mt. Carmel, Doylestown. Ceremony: The National Shrine of St. Rita of Cascia, Philadelphia. Reception and food: The Ritz-Carlton Philadelphia. Photography: Benjamin Deibert Photography, Philadelphia. Videography: Steve K. for Lily & Lime. Dress: Kleinfeld Bridal, New York. Music: Midnight Hour Band from BVT Live! Chadds Ford. Makeup: Dylan Michael Cosmetics, Jenkintown.